Why Francis values the assassinated Archbishop Romero so highly. El Salvador 18 11 2013 B Ciudad Barrios (325). Archbishop Romero Trust. flickr cc. The assassinated Archbishop of San Salvador 1977-80, Oscar Arturo Romero, is to be canonised in October. It is time to reflect again on Romero’s life and times in El Salvador, and on the significance of his canonisation now. 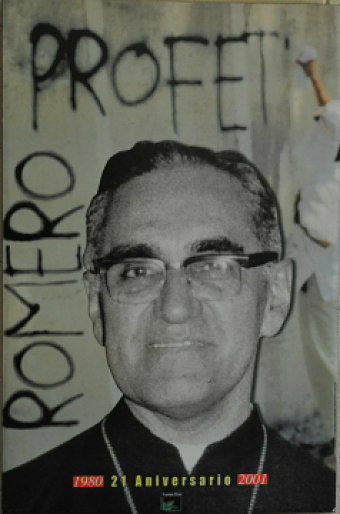 Romero became known around the world when he was assassinated by a right-wing militiaman in March 1980 while celebrating Mass. He has remained a revered but also controversial figure in Latin America since then. Elsewhere, until Pope Francis proclaimed his beatification in December last year, memories had faded, though revived a little with the worldwide release of the film ‘Romero’ in 1989. We can search for Romero in documented events of his episcopacy. These locate him in the context of the war waged by the El Salvadoran Army and militias against the rural poor and those who took up their cause in the 1970s and ‘80s. Here we find the man of courage, who, while always trying to maintain dialogue with the oppressors, was fearless in denouncing violence wherever he found it, whether on the armed Right or Left. El Salvador 14 11 2013 A UCA (11). Archbishop Romero Trust. flickr cc. The record shows us that it was from the Right paramilitary forces that he had most to fear. Their propaganda included the angry mantra “Be a patriot, kill a priest”, and the record of Romero’s ministry includes his officiating at the many funerals of executed clergy and lay peasant leaders in rural base communities in every year of his episcopacy. As the atrocities mounted, Romero not only denounced the violence, but took actions which demonstrated that the Church under his leadership refused to serve as the third plank, along with the Army and the landed elite, of the El Salvadoran regime. It had often been so, though not uniformly. When he refused to attend a presidential inauguration because of the government’s failure to pursue the murder of the parish priest Rutilio Grande, he shocked the powers that be. But when he defended the right of rural workers to organize, and thereby signalled that he was on side with their land reform agenda in the name of the Gospel of social justice, he was quickly marked for assassination by the militias. His fate appears to have been sealed when he told the soldiers of the military government in March 1980 that they did not have to obey the immoral laws and commands under which they were sent to kill their brothers and sisters. It would be a mistake to read Romero and his significance only from such a sketch of the record of his stands in the political arena. 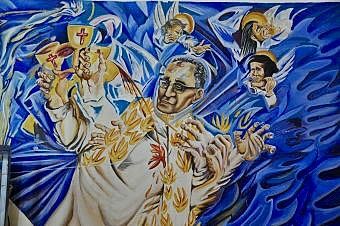 At very least we need to reconcile political Romero with the Romero we find in the portraits penned by his colleagues and those who observed him in his everyday life and ministry. In these we find, above all, a pastor who was drawn into political confrontation as he pursued his pastoral priorities. Here is a picture of Romero the pastor penned by my friend, the journalist June Erlick, now editor of the Harvard magazine of Latin American Studies, Revista. June interviewed and accompanied Romero on one of his pastoral visits in El Salvador in 1979: In visits to small villages and slums he listened more than he preached… What really impressed me was how much a minister Romero was. He wasn’t talking about human rights abuses. He was there as a pastor, comforting, mostly listening. Another friend, Pepe Simán, fills out the picture of the listener. Pepe was coordinator of the Archdiocesan Council for Justice and Peace when Romero was appointed archbishop. As a young layman inspired by Vatican II and then by the Medellín declarations of the Latin American bishops, Pepe had been initially dismayed by Romero’s appointment because of his reputation as a bookish, distant conservative, an enforcer of rules appointed to keep the Church safe and in place in the prevailing order. Pepe quickly discovered that Romero was not as expected. When he returned to San Salvador as Archbishop, he chose to live simply in a room in the cancer hospital rather than in the episcopal palace. He quickly called for help and expert advice, even from experts he knew mistrusted him, to document what was happening in the countryside. He visited every corner of his Archdiocese to listen and discover the truth about the new base communities and investigate alleged atrocities by the regular and para military. He then communicated his findings and recorded his reflections on his own continuing spiritual journey in radio broadcasts of his Sunday homilies, and in a stream of pastoral letters. In these accounts we see Romero the exemplary Vatican II pastor, and they help us understand why Pope Francis chose to champion the cause of his canonisation. Romero manifests Francis’s own vision for the Church in a rapidly changing world. This sees a Church that listens more than it pronounces; that is on the move in the world lightly encumbered (cf. Mark 5:7-13); that is organised less in terms of ensuring hierarchical line command but more to nurture exchange and dialogue between clergy and laity, between levels and functions, between local communities and units of greater scale in the Church. These are characteristics of the Church that Francis tells us Romero found necessary for the Church to become the voice of the poor, and to lead the People of God in the search for justice and peace. Romero is not being canonised for his politics, but it is inescapable that Pope Francis himself has taken a strong stand in Church politics as he has advanced Romero’s cause. Dr Rowan Ireland is a specialist in Latin American studies, and has taught at La Trobe University. He has done much of his fieldwork in Brazil.